Flywheel will be rocking, with folks of all ages bopping around to power chords and sing-along vocals, funky bass lines and power drumming. And it will all commence well before lunch—or nap—time. “Noon is the new midnight in the world of kindie music,” says R.O.C.K. (The Royal Order of Chords and Keys) guitarist and lead singer Aric Bieganek. 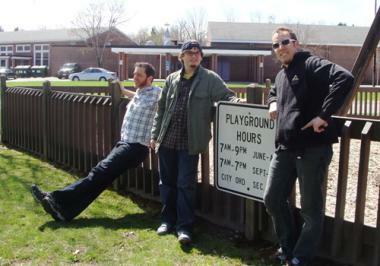 “Kindie” rock—childrens’ music with a hipper, indie rock flavor—is all the rage, and Easthampton-based R.O.C.K is at the vanguard of the growing movement. Bieganek, who labels his brand of punky kids’ music “Ramones Meets Raffi,” says the current trend grew out of a lack of diversity of styles of family music being offered by monoliths like Disney and other commercial outlets. Parents took it into their own hands to create, support and advertise local children’s musicians in their own cities and regions, using the Internet as a powerful marketing and networking tool. Groups like his have been able to access more venues and gigs and find support without having to sign any kind of label deals. It’s a fast-growing industry, fueled by satellite radio, podcasts, and events like Brooklyn’s KindieFest, a large annual family music conference where R.O.C.K. recently performed. The band— Bieganek, bassist David Picchi, and drummer Hans Dalhaus—celebrates the release of its debut full-length, Punk Rock, One Sock!! !, at Flywheel June 27. Lead man Bieganek has been heavily involved with music since he was a wee lad himself. He grew up in a musical family and was a member of the St. John’s Boys’ Choir in Minnesota, a group that toured exotic locales like Japan and the Bahamas. He says that formative experience had a lasting impact on his life, and fostered a love of music and performing that he carried into high school. He then embarked on a more conservatory-style collegiate experience as a piano performance major at a small college in Minnesota before transferring to the Berklee College of Music in Boston, where he gained a Bachelor of Music degree in songwriting. Bieganek’s been teaching and entertaining in the music world ever since, but it wasn’t until early last year that he decided it was time to start a kids’ rock band. After just one rehearsal in a dingy basement, Bieganek says it was clear that R.O.C.K. was meant to, well, rock. Bieganek’s current songwriting is born out of his teaching experiences with students. He says he began writing family-oriented music as a teacher in New York City after it became evident that his families were bored singing standard kid songs that weren’t relevant to their lives. Bieganek credits his teaching for his constant improvising and for keeping him in the groove of writing songs for families, which are coming quite easily to him these days. He says becoming the parent of his own child has been inspiring as well, and the title track from Punk Rock, One Sock!!! was inspired by his daughter who, as a nine-month-old, couldn’t stop taking her socks off. Similarly Dalhaus was inspired to write “Potty Time” while—you guessed it—potty training his son. It’s not just kids who are into R.O.C.K.’s kindie stylings. Rocker parents—weaned on bands like the Pixies and Nirvana—truly appreciate what the trio has cooking. Families are loving the live shows as well, which feature oodles of audience interaction, non-stop dancing and hopping up and down, and plenty of energy from all quarters. How does a band get motivated to start rocking before noon—unheard of in the rock world, but common practice in the world of kindie rock? He claims an additional benefit to the early starts: the band never has to worry about people getting too tired to hang around to see them play into the wee hours of the morning. For songs and more information, visit http://www.welcometorock.com. This song from the Seattle Kindie Rockers has a Vampire Weekend vibe. The video is outstanding, featuring Drew dressed up in a giant paper bag costume as “Sack Lunch.” He’s walking around Washington, D.C. in costume, waiting for his owner while he/she is seeing all of the sights. Such a sweet song. “Pop Fly” is the best song about baseball since Peter, Paul and Mary’s “Right Field.” It was incredible to hear live at Kindiefest. “Fire Truck” is always popular with Aric’s students. It’s an interactive, fun gem of a song about real-life community helpers, and it has a really cool acoustic country twang to it. This song is more or less an indie-rap song. A Dad at Aric’s preschool once walked in hearing it and said, “Is that Cake?” (as in the band Cake). Hopefully he took Aric’s advice and went out and bought this album. It’s worth it for the slide whistle solo in “Bear Bus” alone. It sounds like turntable record scratches. At Kindiefest, Aric got to hang out with the “kid-hop” artist 23 Skidoo at the merch table selling CDs, and a little girl happened to find a penny on the ground near the table. He took the opportunity to tell the girl all about how lucky she was to get a penny. He spun around the topic rhythmically and was borrowing from some of the lyrics to his song, “Luck.” The girl sat there in a smiling trance while her mom was totally confused. It was awesome. So is this song. This song is just as imaginative and fun to both kids and adults as it ever was! Nobody hates this song. Speaking of imaginative songs, “Garbage Barge” is as funny as it is serious. It lists off all these disgusting and very silly things on the Garbage Barge, but then at the end, it rings a line that is so true (except for the mer-people part): “and all the mer-people say, ‘If you throw it away, there is no away. '” It’s a little like the “Mercy, Mercy Me” of Kindie music, but sillier. This New Wave robot kindie music guy really proves his point. He truly seems to be a robot as he performs live: he has special interactive robot glasses, a shiny New Wave vest and a fancy toy-like guitar. He pushes Play on his drum machine, and then, look out: the robot is unleashed, and his dreams of being a “Good Bot” are realized. Honoring the time-honored American tradition of squirrel counting, local hero and awesome dude Mister G sings a song about one of our favorite animals.